North Piedmont is an area with a long standing grape growing tradition and is the home to some of the most prestigious and highest quality grapes in the world. Here at Cascina Preziosa grapes have been traditionally grown on the rich ancient marine soil since the 1700s. After the vineyards were abandoned because of textile and automobile industrialisation, and also due to the splitting up of the vineyards over the course of generations, we are today experiencing the re-birth of the wine farm in this unique grape growing area of North Piemont. The main philosphy of Cascina Presioza is research into obtaining the maximum quality whilst respecting the traditions of the area, naturally using only grapes from our own production. 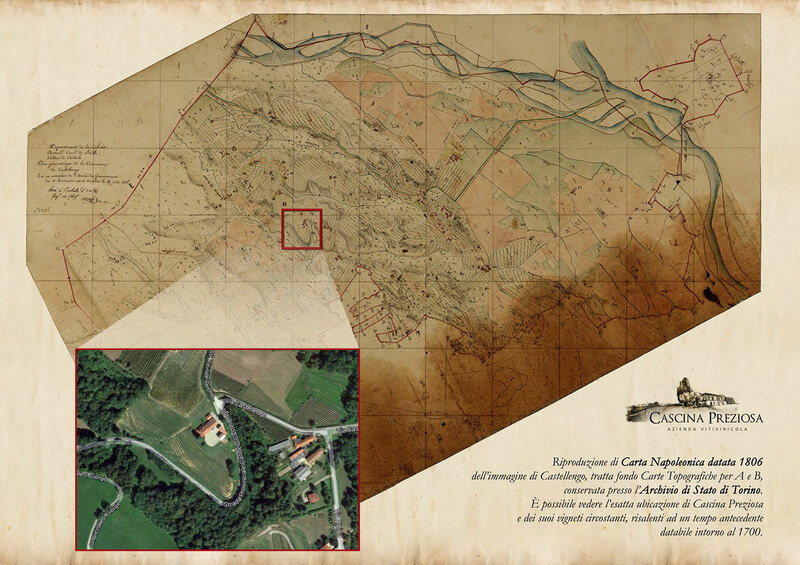 The Napoleonic map dated 1806 of Castellengo image, it comes down Topographic Maps for A and B, preserved in the Archives of State of Turin. You can see the exact location of Cascina Preziosa and its surrounding vineyards, dating back to a time before dating from around 1700.